Where did you get the idea behind The Detriment? The Detriment deals with real life cases, things that really happened. So it’s not so much where I got the idea from, but more - how fictional is the tale that I have told, and why I’ve decided to tell it? One of the issues that I deal with in The Detriment is about keeping secrets, about what happens when you’ve previously agreed or decided to keep something secret, and then you either can’t or won’t any further, and the secret or secrets are exposed to the world for all to scrutinise. I guess this is a question that I wrestle with myself all of the time, and why it is at the heart of my book. Should the public be kept in the dark so much with regard to the inner workings of government and their security? The book deals with conspiracies. Obviously, some conspiracies occur, but equally there are also lots of groundless conspiracy theories out there. As someone who has investigated such things through your work, how would you advise people tell the difference? It’s often very difficult, especially in today’s non-stop news environment, to decipher the groundless from something that has substance. My main piece of advice is never believe anything that is reported anonymously. If the source is ‘unnamed security or intelligence officials’ – treat it as possibly made up. And even if it’s not made up, even if it has come from an intelligence database, it’s very, very easy to falsify intelligence and make it look like it’s a fact. Evidence is very different from intelligence, which is a theme in my book too. A strapline you use is, ‘I can’t tell you the truth, but I can tell you a story…’ Reading the book and knowing that it is at least in part based on your own experiences, how true are the conspiracies swirling around in the book? Are they completely fictional? I leave it up to the reader to decide how much is real and how much is fiction. 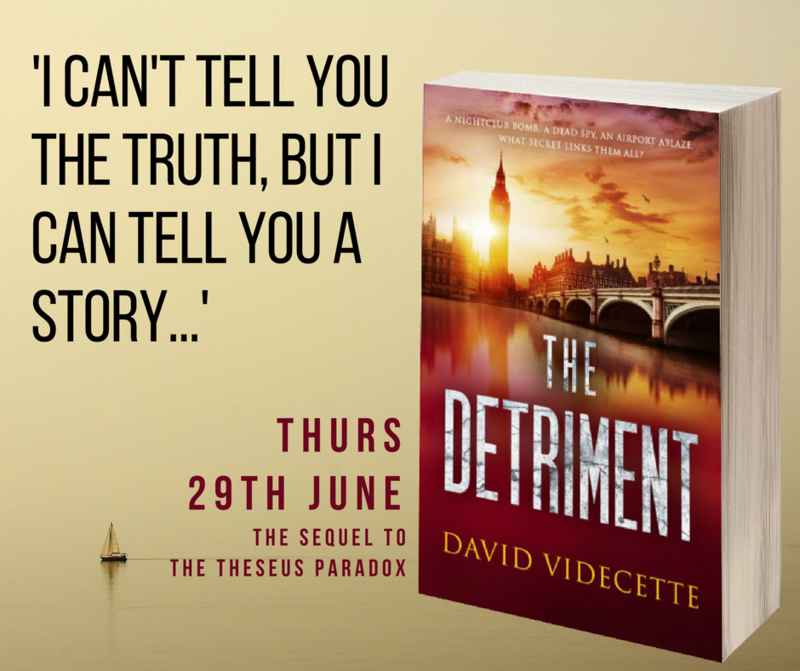 Some secrets are a crime to tell, while others are a crime not to tell – it’s the moral dilemma at the heart of many of my stories and often my life itself. There are very few people that know what elements of my stories are fact, and which are fiction. Much of the time, I am the only one who knows. It’s best that way. How do you get your ideas? What’s the process and how do they go from vague inspiration to fully fleshed-out notions? The events that I write about are true to life, and are just waiting out there to be turned into ‘a story.’ The inspiration for me to do that often comes from something that I see as unjust, or I see as something that people should know about. So that’s when I draw upon my experience to ‘re-tell’ something as fiction; it’s my way of shaping the future by not forgetting the past. Other than your own experiences, tell me about the research that goes into your writing? I am constantly reading or researching something. Very often I will start with something that I need to prove as fact, before I can write about it on a fictional basis – it’s an odd and extremely frustrating process sometimes. Tell me about your writing, do you write full time? I have a jam-packed life. As well as the books, I also work as a consultant in the personal security sector for high-net-worth individuals. I write and commentate for various news and media outlets both at home and internationally - and I have two teenage daughters that think I’m their personal chauffeur. In amongst all of that, I fit my writing in! When is your most productive period of the day? 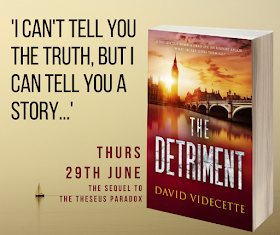 The Detriment, like the Theseus Paradox that came before, is a brilliant thriller. I note that your main character is also an anti-terror detective. Is any part of it biographical? I know you’re working on a third title in the series. Can you tell us anything about that? We see Jake in a different environment, working abroad, which is something I also did during my career as a counter-terror detective. I have another project in pipeline based on an unsolved real-life murder. I’m currently in discussions with various different parties about it. It may turn into a factual book, a TV documentary, or I may have to ‘fictionalise’ it. That it takes more motivation than I ever could have imagined to see a project through from start to finish. And that it’s not always about literary prowess, but a lot about how you package your work succinctly, and communicate it appealingly to readers. Give me some advice about writing? Keep the plot and writing as simple as possible. Less really is more in most cases. Crime-fiction fans can chat to David on Facebook, or Twitter or Instagram, or find out more about him here. Or take a look at all his books on Amazon. For the chance to win a signed paperback copy of his next release, enter your email address here, and you’ll go into the hat each time a new title in the DI Jake Flannagan series is ready. The Theseus Paradox is available to buy on Kindle or in paperback at Amazon. 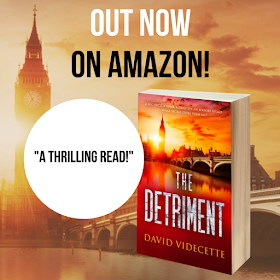 The Detriment is out now and can be ordered on Kindle or in paperback. For free worldwide delivery, check out all David’s books at The Book Depository.